... and then the next Woolly Wednesday gathering will be on 5th June! Hello to everyone who reads and joins in with Woolly Wednesday. 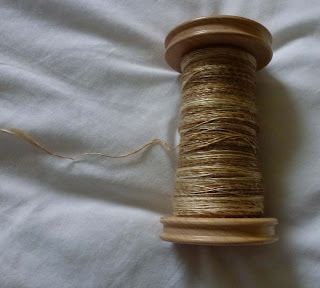 I have really enjoyed posting Woolly Wednesday and visiting blogs to read what others are up to, what they are spinning or creating, being inspired. I hope to continue to enjoy all that but want to let everyone know of some changes that are being made. 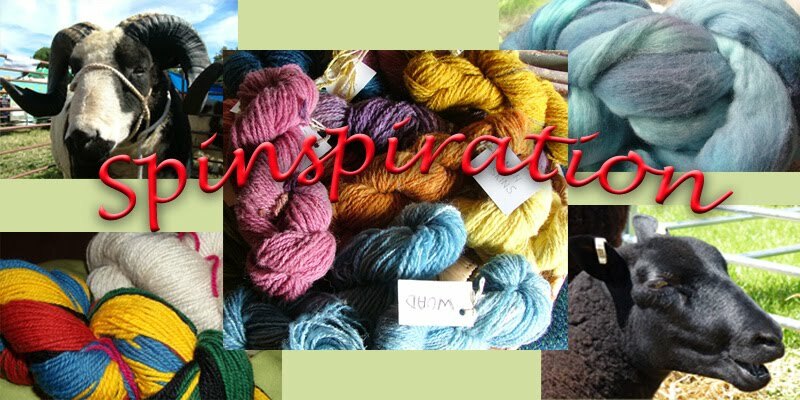 This blog came from an online friendship a few years ago, an idea to create an online space to share inspiration, wise words sometimes and projects in spinning mainly but also any other woolly adventures. Last year there were changes when Kelly moved back to her home land and was less able to join in writing on the blog, and new authors joined. Due to other commitments and time, which is understandable as we all have busy lives, it has just been myself writing recently. Due to this and also because I have another blog, which sadly gets neglected at times so as not to repeat myself, I am going to merge Spinspiration with my other blog which can be found here. I would really love to still link up with you all so will be posting the Woolly Wednesday linky there so please do visit and update your links to join me. During the week I shall hopefully merge the 2 blogs (fingers crossed!) and change any necessary settings. I hope to see you there next week, in the meantime have fun with your woolly adventures, I know some of you have been to Wonderwool, as have I, so look forward to reading all about it on your blogs. I shall be sharing my experience of Wonderwool on my blog for Woolly Wednesday for next week. Welcome to our Woolly Wednesday gathering for April, sorry we are a week late but now also a day early! 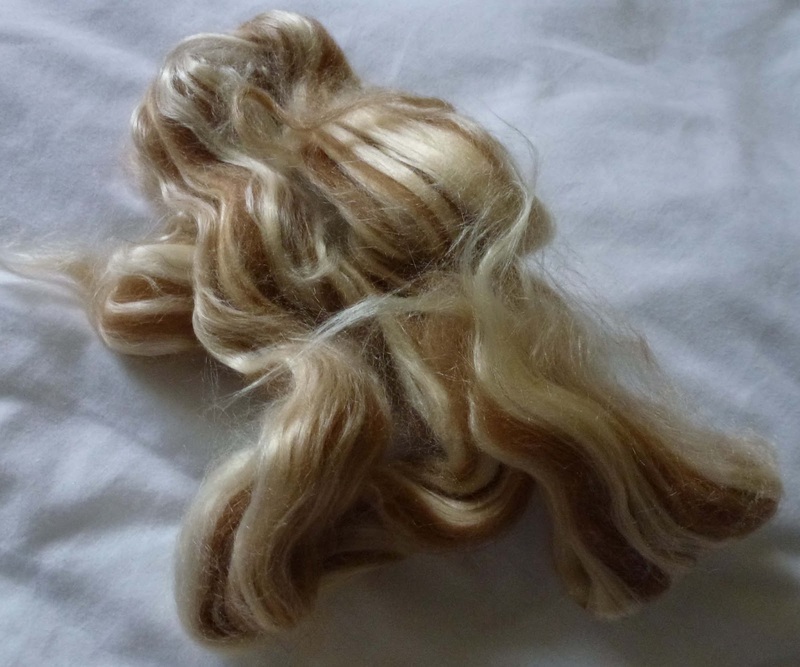 Whether you are a regular or a new visitor - come and share with us all what you have been doing with wool or fibres in the last month, or plans for the month(s) ahead. All crafts and inspiration welcome. Please feel free to add the button to your blog's sidebar with a link to Spinspiration, a lovely way for us all to link together. Just copy the image to your desktop and then in your blog design - add a gadget, add picture - upload the picture and then add the url (http://spinwheelspin.blogspot.com/) and the image will link to here. Join us with the linky below, link to a recent blog post of your woolly adventures in the last month or to a post in the month ahead, we look forward to seeing you, no time limits just join us when you can. Well with the current Spring (really?) weather here in the UK, there is still lots of knitting going on - we need those woollies! Complete contrast to the Easter holidays of the last two years; in fact around this time 2 years ago we were enjoying days on the beach! We have had a few nice warm days now, but could do with a lot more, and a lot more sunshine. So I have finished a project I can't share pictures of just yet, so we'll just skip over that. 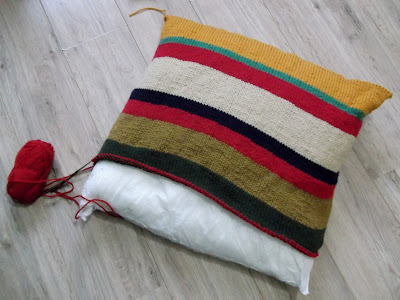 Here is my cushion that is in progress that I forgot to photograph last time - it's not far from the right size but I haven't knitted it for a few weeks - should really push to finish and sew a zip in it. Then I can start the next ones, which are a lot smaller so I can knit them up quicker. I knitted myself a new phone cover for my new phone, finally joining the 21st Century with a decent one. This was knitted using Judy's magic cast on - a lovely invisible cast on - and knitted in the round - just worked out how many stitches I thought it would need to be a snug fit, knitted in smaller tips for the yarn for a dense fabric. The yarn is all sorts of blends from our Guild fibre day where Wingham Wool visit with all their goodies to sample and buy. 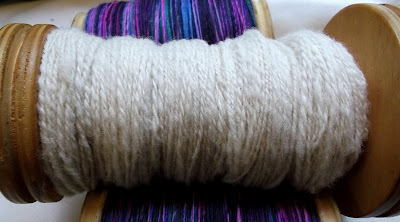 I sampled lots of different things and chain plied it all to retain the colours and have a lovely skein of variation. Some has now been used on this and the rest is going to be used on the Guild challenge project this year I think. Another photograph I forgot last time was the Merino I spun from fleece from Queensland, here it is, no plans yet - I may dye this now. Other recent activity has been finally getting around to cleaning up and oiling the Westbury wheel I bought last year from a local charity shop. A little rough in places, I sanded her lightly and cleaned all the parts removing a little rustiness off the metal parts and then gave her a good drink of Danish Oil on the wood (this prompted me to give the other wheels a clean and coat of oil too). The leather bearings on the Mother of All were in a sad dry state so have had a good soaking of oil too. Now she is spinning like a dream - a little noisier than my other wheels but that just adds character! The wheel is for my daughter to learn on really, which I think will happen this year more and be much easier on this spinning wheel. The treadling is so light and responsive and as the wheel is weighted it starts straight away and stops smoothly too. She may well go out on loan briefly first, but does need some more bobbins which are hopefully in the making soon when my Dad can get to use his lathe ... when the weather is warm enough to be out in the shed! 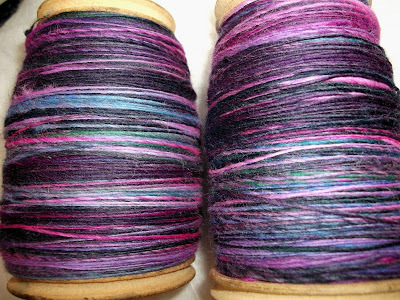 Spinning this month has been a roving/tops of merino dyed in deep purples, pink, blue, green which I want to make a 3 ply yarn with a grey - so I need to spin the grey for this soon. Other spinning has been spinning my way through lots of samples I have of different breeds, a bit of this and that from various places - Winghams, gifts, part fleeces, odds and ends from Guild, etc. I'm building up lots of mini-skein samples, and trying to record notes on breeds and samples too, kind of a spinning journal - a work in progress! I have a long term project mentioned previously on this blog I think, using as many breeds as I can spin so these samples are perfect for that - for all the breeds I spin I am going to weave a square on my Weavette loom and they will all be sewn together for a finished project to show the variations in breeds, natural colours, etc and have it at demonstrations and open days for people to see. I previously used some of these to make this cushion. Easter holiday break? ... or alternatively "Oops I forgot to post the linky!" Sorry folks, back next week for April's Woolly Wednesday, hope to see you there to catch up with all your woolly days. Sorry for late writing and linking, I actually wrote all this last night and only needed to add the photos but didn't get a chance and have been busy elsewhere today. March already ... where does the time go? Still spinning away the days when I can, and knitting too. Now this is not an easy post to write to day as some projects are *secret* and I need to make sure I don't show too much of them online in case the recipient sees it - they don't now things are for them so until they are gifted they need to remain un-shared online. So apologies for some lack of detail or photos. 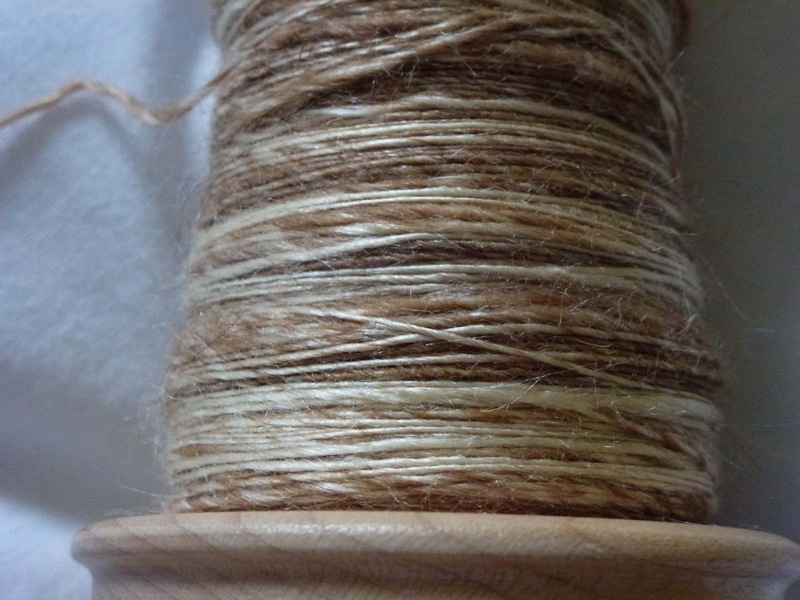 Well I spun a 2ply Merino from raw fleece all the way from Queensland, Australia. Ah, woolly gifts are the best! This was quite short so spun semi-woollen/semi-worsted (work that out if you can!). Washed and carded into lovely fluffy rolags. There were some short bits in this which I tried to pick out the worst but grew to live with some of them. Awaiting final wash and measurement. Will possible dye this I think. These are the rolags but I haven't photographed the yarn yet so will add this another time. Which is now all spun up, some has been blended with to create a few shades. More on this yarn another time! Knitting a tunic for my daughter with handspun from last year, slow progress - just keep leaving this to do other things but one day I'll just pick it up and knit, knit, knit. My Monet yarn is wound into yarn cakes now and ready to become a knitted and felted bag. I'm still also knitting scrappy using up odd-balls cushion covers, long term project, you'll see these throughout the year. Not handspun so far but I can see some handspun coming into some of these cushion covers in the planning. What else? Ah yes, I've finally succumbed to the Sheep Heid pattern, having seen some lovely examples recently on ravelry, and a flock of them knitted by a friend at the guild. 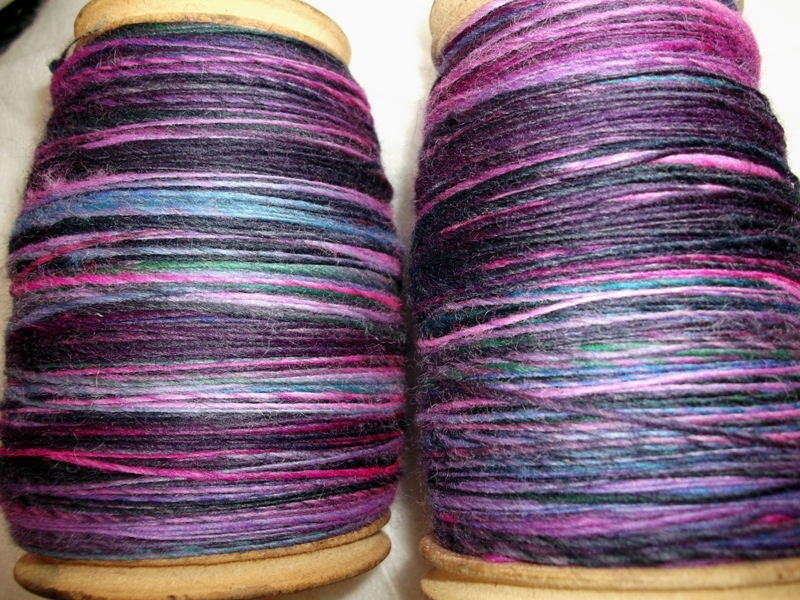 Another friend at the guild bought some fibres to spin for this (edited to add she's finished hers now too!) and in chatting with her about it I remembered some Icelandic yarns I spun last year - there are 5 shades there already - approx 4ply so perfect. They are spun and set as singles so not sure if that will create any issues with stitches leaning but they are not high spun singles so I'm going to knit it and see how it goes. I have therefore spun 4 other yarns in different shades to complete the set. Wow was this a test - making sure there was enough colour variation to see the different sections, and working out replacement shades for those in the pattern, it made my head hurt! I will add a picture later (sorry not prepared was I?!). 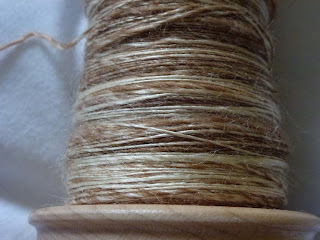 I think that's it for now, more spinning planned to work through the fibre stash. Looking forward to warmer drier days to get some fleece washed. Another long term project in the planning for the Guild challenge for 2013 - 'The Second Time Around' Guild Challenge' - 'upcycle', 'revamp' or 'reinvent' to breath new life into something. So I have a plan!